The 60-second clip ends with a play on Kit Kat's famous slogan: "Have a break? Give orangutans a break." 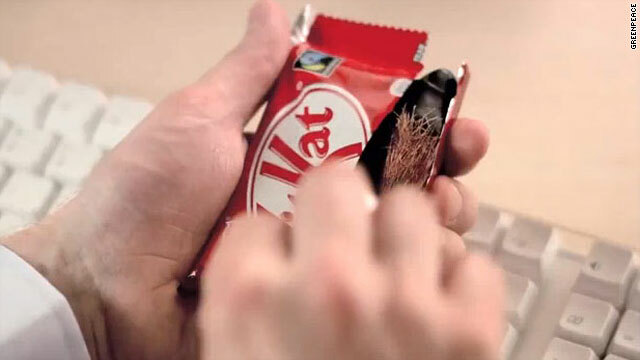 Clip ends with play on Kit Kat's famous slogan: "Have a break? Give orangutan's a break"
(CNN) -- A video clip which shows an office worker opening a Kit Kat chocolate bar and finding an orangutan's finger has been re-posted on video-sharing Web site YouTube, a day after it was removed at the request of food giant Nestlé. The viral campaign, which parodies a Kit Kat television commercial, was intended by Greenpeace to highlight how Nestlé buys palm oil -- a key ingredient in many of its products -- produced from the destroyed rainforest homes of the last orangutans in Indonesia. According to Greenpeace, Nestlé asked YouTube to remove the clip citing copyright concerns. In its place was the message, "This video is no longer available due to a copyright claim by Societe des Produits Nestlé S.A."
A spokesperson for the environmental campaigners told CNN the copyright infringement claim was "a pretext for stopping the word being spread and an apparent attempt to silence us." But Nestlé UK, one of several divisions of the company that produces Kit Kats, denied this, saying it had contacted YouTube via their official copyright complaint web form. "We notified YouTube about the campaign video's infringement of the visual identity of our Kit Kat brand. The video is now back up and we will not submit the form again," a Nestlé spokesperson told CNN. Despite the Nestlé intervention, Greenpeace said it re-posted the clip to video-sharing Web site Vimeo.com and used Twitter to spread the word about the attempted censorship. It added that many Web users had re-posted the clip to YouTube and other destinations on the Internet themselves, resulting in over 300,000 views so far. Greenpeace has accused Nestlé of using palm oil from Indonesia's largest palm oil producer, Sinar Mas, which it says is clearing orangutan habitats and breaking Indonesian law in order to expand production. In a report entitled "Caught Red-Handed," Greenpeace said it has evidence Sinar Mas is not only clearing forests but destroying carbon-rich peatlands. It said burning and draining these peatlands releases vast amounts of greenhouse gases into the atmosphere, helping to make Indonesia the third largest greenhouse gas emitter in the world. It also accused both firms of ignoring its commitments as a member of the Round Table on Sustainable Palm Oil (RSPO), the body set up to make the palm oil industry more sustainable. "The Greenpeace campaign will continue until Nestle has cut the Sinar Mas group from its supply chain. Palm oil is a natural plant oil used in food products such as chocolate, margarine and bread, as well as in cosmetics and the production of biodiesel. But Greenpeace said Nestlé has yet to demonstrate it will take any action to ensure none of its palm oil comes from destroyed rainforest. "It really is just empty words," their spokesperson said. "What they need to do is to state really clear actions which they are taking, part of that is supporting a moratorium on rainforest destruction as well as protecting peatlands." 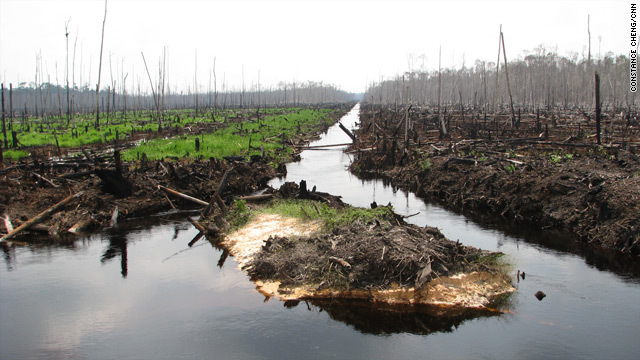 "We raised this issue two years ago with Nestlé, giving evidence of what palm oil is doing to the rainforests in Indonesia and they have done nothing. Unilever stopped their contracts with Sinar Mas and so has Kraft." Greenpeace UK executive director John Sauven said: "Nestlé will still be using palm oil from Sinar Mas in Kit Kats, because they'll still be getting it from their other suppliers. The Greenpeace campaign will continue until Nestlé has cut the Sinar Mas group from its supply chain completely."